“Mitzvah” means commandant and a good deed in Hebrew – and in all cultures being of service to those who need our help is a core belief. So you don’t need to be Jewish to do a mitzvah. You might just call it “community service”. Our Girl AGain resale business requires many tasks which offer job skill development opportunities. The more merchandise we have to prepare for resale the more women we can offer training to, and the more customers we can serve – which keeps our store open. That means we need lots of gently used American Girl merchandise. That’s where you are needed: to help collect it, and to tell our story to girls and their parents about where their loved dolls will go. We know there are lots of dolls in attics and basements that are no longer being played with. Our store is the best place they can go –until an 8 year old girl comes to buy one. Our mission is not only about helping women with autism, it is also about culture change: helping our whole community to accept and include people who are differently-abled. 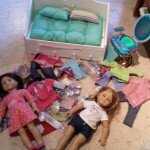 Help Girl AGain by collecting gently used American Girl merchandise for our boutique. Note: this does not mean you have to give your own dolls away if you are not ready to do so; but it does mean that you convince others to donate their dolls and/or their accessories. Maybe a girl who has 4 dolls is interested in donating one, or she may want to keep the dolls but donate the doll furniture. You may want to do this with a friend or with your confirmation class or Girl Scouts troop. We will acknowledge your work for community service credits. Tip: we have learned that putting a poster and collection box at a school door does not work. Girls want to know exactly where their loved dolls are going – they don’t want to dump them in a cold dark box, never sure where they will go. (Remember Toy Story). Donors want to be involved. Success story: one young woman presented to her church on a Sunday morning and then her church hosted an evening collection and pasta dinner. Success story: a Girl Scout troop ran a collection drive for their annual community service project and included all the other troops in the region at a service dinner event. Donors love coming to the store to see where their doll will be cared for and to see another young girl get joy. You will learn that women with autism want what you want: independence, respect, and happiness. Share your experience with your Bat Mitzvah class or your school, church, or mosque. Community service credits will be acknowledged. 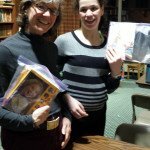 Carly and her mom lead a service project at their church. This will be a rewarding project, an opportunity not only to provide the basis for work for others, but also to have first-hand experience in working side by side with our trainees.